After facing flood and housing struggles, a positive hub has popped up for the South Dunedin community. 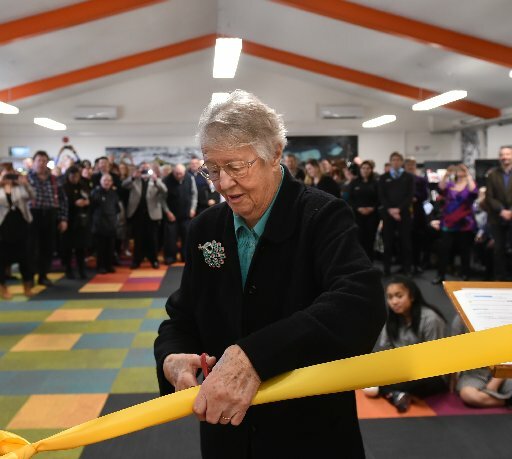 About 300 people packed the Cargill Enterprises premises on Hillside Rd for the formal launch of the hub, which will provide space for community activities, a library, meeting areas and a Dunedin City Council service centre. Former Dunedin city councillor and library lobbyist Anne Turvey said she had spent the past 27 years campaigning for a library for the South Dunedin community. It was important the space was distinctly South Dunedin so the community enjoyed using it, Mrs Turvey said. After cutting the ribbon to open the facility, pupils from the Bathgate School Pasifika Group delivered a rousing performance. Mayor Dave Cull said the opening was a milestone in the city’s relationship with South Dunedin. He hoped the hub would also provide a base for people to provide feedback on the development of a permanent hub. The council had signed a two-year lease for the space. Cargill Enterprises chief executive Geoff Kemp said, 50 years ago this month, Laura, Lady Fergusson, wife of then governor-general Sir Bernard Fergusson, opened the Cargill’s Hall as a facility designated to serve the community. There had been a decline in use of the hall in past years. Following the official opening, the Carisbrook School Choir performed and there were children’s storytelling and craft activities. The hub would be open from 10am today. It was expected it would be open about 25 hours each week.